I would rather write about a specific project on the farm, but we have been so busy that I’ll have to catch up on processes later. I hope this overview will suffice until we catch our breath. This summer has been helpful for some vegetables and fruits such as raspberries, corn and peppers; but not for tomatoes, eggplant, apples, and plums. Normally by this time, six-gallon pots of tomatoes would be processed daily into sauce. Now we’re eating tomatoes and drying batches, but we have yet to start on our sauce-making. 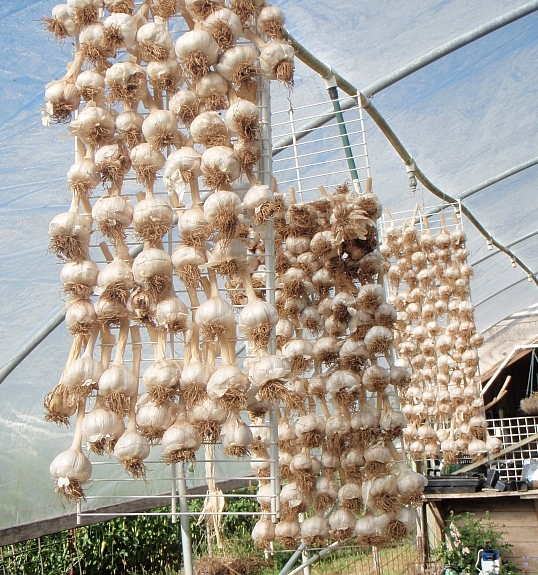 Garlic and onions are drying for storage, and our melons look fat and happy, but not ready to eat. We may lose our grape crop from a late start, but we enjoyed our first fresh ears of corn yesterday. *very good! * Overall, Oregon weather has been a mixed bag this year. As life continues, so do the farm chores. We are up seven piglets, and about twenty-seven ducklings. We were hoping for the piglets, and were gobsmacked by the ducklings … they just kept on coming. Our latest group was hatched from a mother duck who decided she didn’t want to be a mom. Alex took over as protector until they get a little stronger. 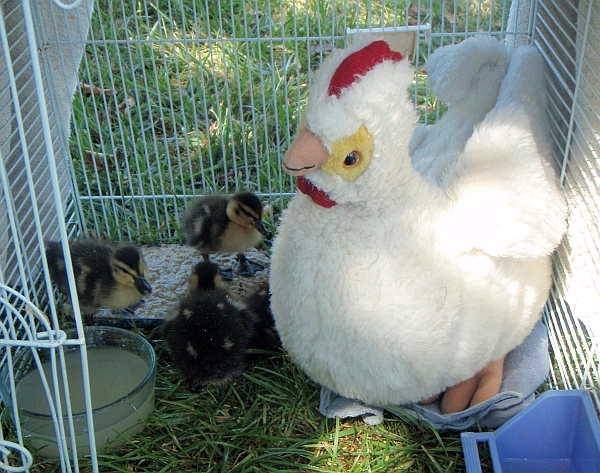 Even a ten-year-old wants a break sometime, so she created a surrogate from a toy chicken. The ducklings took to it right away and snuggled under it to fall asleep. 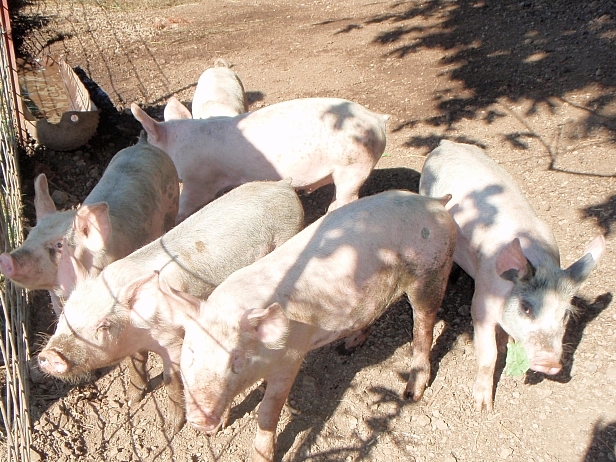 The piglets are a happy lot, but they have torn apart the area very quickly. Nicolae will move them to a nice grassy spot as soon as the wheat has been harvested. We make sure to provide them with a lot of shade and a wallow. Our wheat harvest is underway. 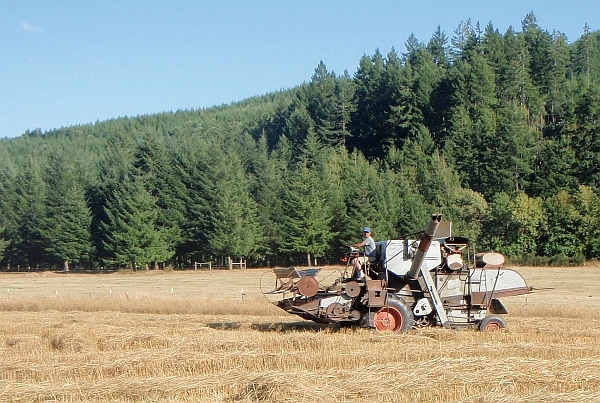 Walt’s wheat is certified organic and bio-dynamic. I really look forward to grinding some myself this week. I hope to post more of the wheat harvesting process later next month. This entry was posted in General, Homesteading, Storage. Bookmark the permalink.